Today's post is contributed by Scott Sherman, otherwise known as loki3 on Shapeways, where he has a wide variety of exotic dice models, including a new kind of d4 and even a d5. You can read more about these models at his Fair Dice page. 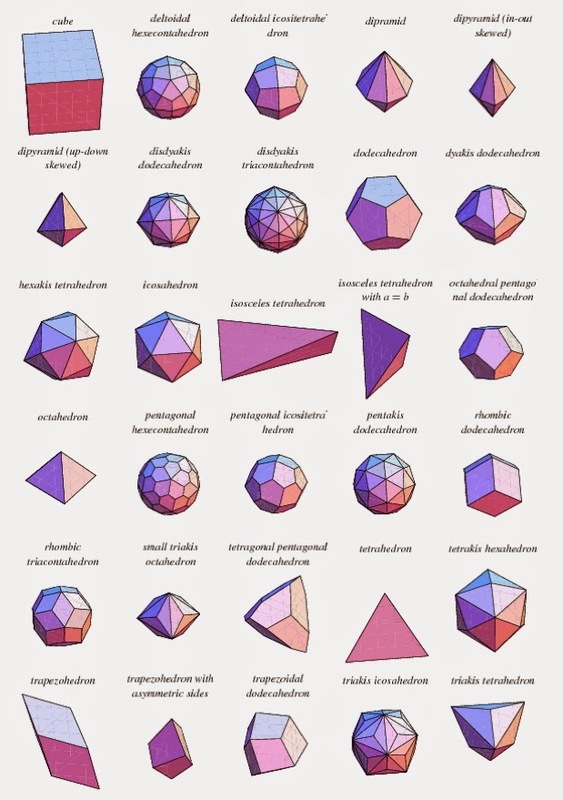 Since fair dice must have an equal probability of rolling any of their numbers, the topic of dice leads naturally into one about isohedra, polyhedra that have all faces the same and all faces in the same transitive relationship with each other. 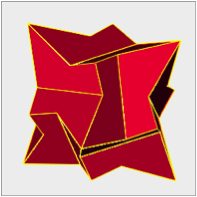 For example, every Catalan solid (see Day 212) is an isohedron. Welcome, Scott Sherman, isohedron master! For most people, “dice” = the numbers 1 through 6 on a cube. The first time I saw any other type of dice was the Platonic solids used by Dungeons and Dragons, with 4, 6, 8, 12 and 20 sides. Then, years later, I saw that D&D added a 10-sided die. 10 sides? That’s not a Platonic solid. Where did that come from? Are there other shapes that could be used for dice? Those pictures are intriguing, but how would one go about creating an “octahedral pentagonal dodecahedron” if one were so inclined? Unfortunately, Mathworld doesn’t have much to say about many of those shapes. And, it turned out at the time I was looking into it, Google didn’t have much more to say on the subject. 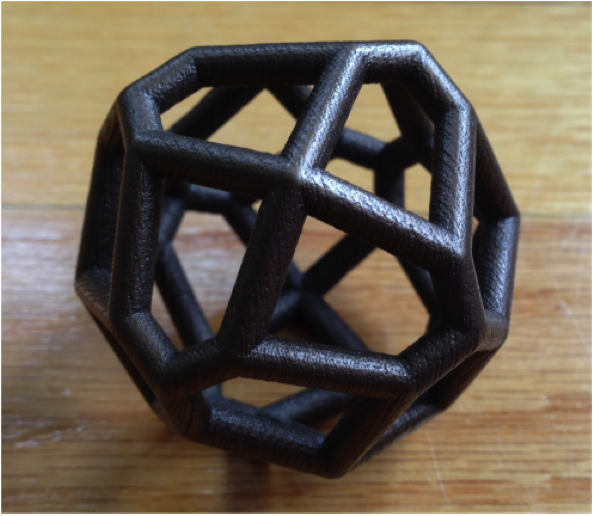 So I set out to reverse engineer those polyhedra based on a few pictures. Many of them turned out to be far more interesting than I was expecting. 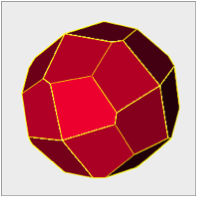 Several turned out to be infinite families of polyhedra rather than just a single shape. I describe how you can construct many of these on my Isohedral Transforms page, but it’s more fun to simply play with them interactively on my Interactive Isohedra page. 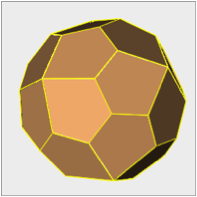 Here’s one to try: On the Interactive Isohedra page, choose octahedral symmetry (the second option under Symmetry) and then select the button for pentagonal faces. In the graph in the lower left, click on "24y" and keep the mouse button pressed (or keep your finger on your tablet) and move around a little bit. You should see the shape morph into different isohedra that share the same overall symmetry. Here are some of the possibilities. What I found interesting when I first played with that symmetry group was that it looked like I could create faces with bilateral symmetry, but it didn’t match any polyhedron I had seen before. If you pick right around x=0.43, y=0.25, you’ll see this shape. Technical notes, nomenclature flavor (from mathgrrl): A polyhedron is an isohedra if all of its faces are the same irregular polygon, and in addition the solid is "face-transitive", meaning that for any two faces on the polyhedron there is some rotation/reflection combination of the entire polyhedron that will take one face to the other. 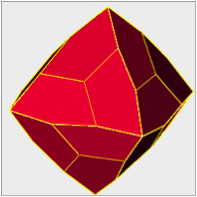 Catalan solids are all isohedra, but have an additional property: they are the duals of the Archimedian solids. This means that their duals have faces that are all regular polyhedra, which in turn means that every vertex of a Catalan solid has edges coming into it in evenly-distributed angles, like the evenly spaced spokes of a wheel. The duals of isohedra are polyhedra with combinations of regular and/or irregular polyhedron faces, and therefore the vertices of an isohedra can sometimes have incident edges that are irregularly spaced around the vertex. For example, the Bilateral Pentagonal Icositetrahedron above has some degree three vertices that have a "Y" shape instead of edges that divide the space around the vertices into thirds.